expanded coverage of steady-state stability using eigenvalue analysis, including modal analysis of dynamic equivalents. The book continues the successful approach of the first edition by progressing from simplicity to complexity. It places the emphasis first on understanding the underlying physical principles before proceeding to more complex models and algorithms. The reader will appreciate the authors’ accessible approach as the book is illustrated by over 400 diagrams and a large number of examples. 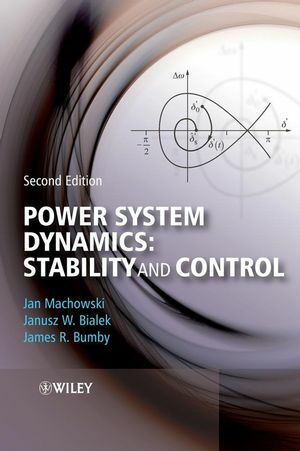 Power System Dynamics: Stability and Control, Second Edition is an essential resource for graduates of electrical engineering. It is also a clear and comprehensive reference text for undergraduate students, and for practising engineers and researchers who are working in electricity companies or in the development of power system technologies. Professor Jan Machowski received his MSc and PhD degrees in Electrical Engineering from Warsaw University of Technology in 1974 and 1979, respectively. After obtaining field experience in the Dispatching centre and several power plants, he joined the Electrical Faculty of Warsaw University of Technology where presently he is employed as a Professor and Director of the Power Engineering Institute. His areas of interest are electrical power systems, power system protection and control. In 1989-93 Professor Machowski was a Visiting Professor at Kaiserslautern University in Germany where he carried out two research projects on power swing blocking algorithms for distance protection and optimal control of FACTS devices. Professor Machowski is the co-author of three books published in Power System control and Stability (WPW, 2007). He is also a co-author of Power System Dynamics and Stability published by John Wiley & Sons, Ltd (1997). Professor Machowski is the author and co-author of Power System stability and power system protection commissioned by the Polish Power Grid Company, electric Power Research Institute in the United States, Electrinstitut Milan Vidmar in Slovenia and Ministry of Science and Higher Education of Poland. Professor Janusz Bialek received his MEng and PhD degrees in Electrical Engineering from Warsaw University of Technology in 1977 and 1981, respectively. From 1981 to 1989 he was a lecturer with Warsaw University of Technology. In 1989 he moved to the University of Durham, United Kingdom, and since 2003 he has been at the University of Edinburgh where he currently holds the Bert Whittington Chair of Electrical Engineering. His main research interests are in sustainable energy systems, security of supply, liberalization of the electricity supply industry and power system dynamics and control. Professor Bialek has co-authored two books and over 100 research papers. He has been a consultant to the Department of trade and Industry (DTI) of the UK government, Scottish Executive Elexon, Polish Power Grid Company, Scottish Power, Enron and Electrical Power Research Institute (EPRI). He was the Principal Investigator of a number of major research grants funded by the Engineering and Physical Sciences Research Council and DTI. Professor Bialek is a member of the Advisor Board of Electricity Policy Research Group, Cambridge University, a member of the Dispute Resolution Panel for the Single Electricity Market Operator, Ireland, and Honorary Professor of Heriot-Watt University, Scotland. Dr Jim Bumby received his BSc and PhD degrees in Engineering from Durham University, United Kingdom, in 1970 and 1974, respectively. From 1973 to 1978 he worked for the International Research and Development Company, Newcastle-upon-Tyne, on superconducting machines, hybrid vehicles and sea-wave energy. Since 1978 he has worked in the School of Engineering at Durham University where he is currently reader in Electrical Engineering. He has worked in the tear of electrical machines and systems for over 30 years, first in industry an then in academia. Dr Bumby is the author or co-author of over 100 technical papers and two books in the general area of electrical machines/power systems and control. He has also written numerous technical reports for industrial prizes including the Institute of Measurement and Control prize for the best transactions paper in 1988 for work on hybrid electric vehicles and the IEE Power Division Premium in 1997 for work on direct drive permanent magnet generators for wind turbine applications. His current research interests are in novel generator technologies and their associated control for new and renewable energy systems. PART I: INTRODUCTION TO POWER SYSTEMS. 1.1 Stability and Control of a Dynamic System. 1.2 Classification of Power System Dynamics. 1.3 Two Pairs of Important Quantities: Reactive Power/Voltage and Real Power/Frequency. 1.4 Stability of Power System. 1.5 Security of Power System. 2.1 Structure of the Electrical Power System. 2.4 Transmission and Distribution Network. 2.6 Wide Area Measurement Systems. 3. The Power System in the Steady-State. 3.6. Power Flows in Transmission Networks. PART II: INTRODUCTION TO POWER SYSTEM DYNAMICS. 4.2. Three-Phase Short-Circuit on a Synchronous Generator. 4.5. Short Circuit in a Network and its Clearing. 5. Electromechanical Dynamics – Small Disturbances. 5.4. Steady-State Stability of Unregulated System. 5.5. Steady-State Stability of the Regulated System. 6. Electromechanical Dynamics – Large Disturbances. 6.2. Swings in Multi-Machine Systems. 6.3. Direct Method for Stability Assessment. 6.5. Asynchronous Operation and Resynchronization. 6.7. Torsional Oscillations in the Drive Shaft. 7.2 Induction Machine Equivalent Circuit. 7.3 Induction Generator Coupled to the Grid. 7.4 Induction Generators with Slightly Increased Speed Range Via External Rotor Resistance. 7.5 Induction Generators with Significantly Increased Speed Range: DFIGs. 7.6 Fully Rated Converter Systems: Wide Speed Control. 7.7 Peak Power Tracking Of Variable Speed Wind Turbines. 7.8 Connections of Wind Farms. 7.9 Fault Behaviour of Induction Generators. 7.10 Influence of Wind Generators on Power System Stability. 8.3. Critical Load Demand and Voltage Collapse. 8.6. Prevention of Voltage Collapse. 8.7. Self-Excitation of a Generator Operating on a Capacitive Load. 9. Frequency Stability and Control. 9.2. Stage I - Rotor Swings in the Generators. 9.3. Stage II - Frequency Drop. 9.4. Stage III - Primary Control. 9.5. STAGE IV - Secondary Control. 9.6. FACTS Devices in Tie-Lines. 10.7. Unified Power Flow Controller . PART III: ADVANCED TOPICS IN POWER SYSTEM DYNAMICS. 11. Advanced Power System Modelling. 11.3. Turbines and Turbine Governors. 12. Steady-State Stability of Multi-Machine System. 12.2. Steady-State Stability of Unregulated System. 12.3. Steady-State Stability of The Regulated System. 13. Power System Dynamic Simulation. 13.3. The Simultaneous Solution Methods. 13.4. Comparison Between the Methods. 14. Power System Model Reduction - Equivalents. 14.3. Aggregation of Generating Units. 14.4. Equivalent Model of External Subsystem. 14.6. Properties of Coherency-Based Equivalents.